case studies substantiating each of the benefits. That is why remembering a person’s name is one of the basic sales tactics. In email marketing it is often referred to as email personalization. Imagine, every morning you come to a Starbucks and barista recognizes you and call by name. It seems as if you have some sort of personal relations with him. But what if he or she also knows what kind of coffee you like and pours it to you immediately as you enter? Even cooler! Also, email personalization goes beyond calling someone by name in email copy or subject lines. Depending on your customer segment, you can personalize copy, images, or even product offers using special data gathering software. But even if you personalize only the subject lines, it could increase the probability of your emails to be opened by 26%. So, what are the benefits of email personalization? You probably can imagine that personalization can increase your conversion rates. Like in this case study on Paper Style website. 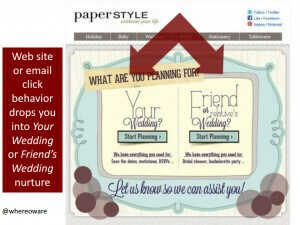 Paper style is an invitation sending company. They analysed website behavior of their visitors, and their purchase patterns. It turned out that they have two separate audiences – brides and friends of the bride who are helping with the wedding planning. They set up two tracks on their website, one was for “planning your wedding”, another one was for “planning your friend’s wedding”. People who signed up to these two tracks receive completely different set of emails. This personalization led to impressive results for Paper Style: 244% boost in open rate, 161% increase in clickthrough and most importantly, revenue per mailing increased by 330%. But even a less sophisticated solution can yield great results. The Expert Institute, a New York City-based legal service platform startup, cleaned up their email list to have first names of all their subscribers. Using database of the most common names, they managed to match 95% of their contacts. Then they launched their first email from their VP. Based on the response to this email they segmented their list into: most engaged, moderately engaged and least engaged subscribers. Each group then got a slightly modified email. Do you know that 75% of consumers like brands to personalize their offers? And 86% of consumers say that personalization plays role in their decision making. Customer retention and reactivation is built on familiarity and relationship. Email personalization can contribute its fair share to both of these factors, because it allows you to send personalized messages to each segment of your customers whichever it would be. EyeBuyDirect.com decided to add personalized product recommendation to their email campaigns. They recorded 175% increase in clickthrough rate and 30% increase in conversion only by sending a more personalize message to their audience. Another story about customer reactivation. Diamond Candles, a candle shop originally started on Facebook and heavily reliant on social media, decided to make some use of their fast-growing email list and start to hold regular email campaigns to reactivate their user base. People are bombarded by different content, products or services. In most cases they are completely irrelevant and useless. By providing personalized experience, you reduce the noise surrounding your customers and make your offering more relevant to them. This especially concerns newsletters because they are the type of marketing email where your marketing needs align with the interest and needs of your target audience. Look how denamico created a hyper-personalized newsletter. 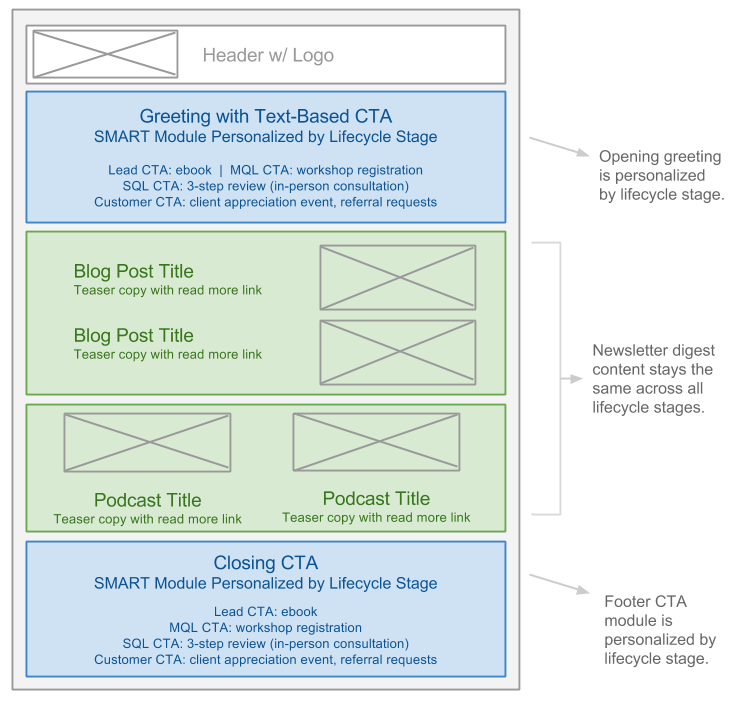 They wanted to create a newsletter whose content will be personalized based on contact’s lifecycle. They used special software to tackle this challenge. Excising customers saw an option to invite/refer new client. The open rates rose by 43% while clickthrough rate grew by 89%. TechnologyAdvice, a consultancy service, also addressed leads on different stages of sales funnel using personalization and automation. As a result it doubled open rates (went up from 20% to 40%) and tripled clickthrough rates (from 2% to 6%). Perosnalization is a powerful tool. 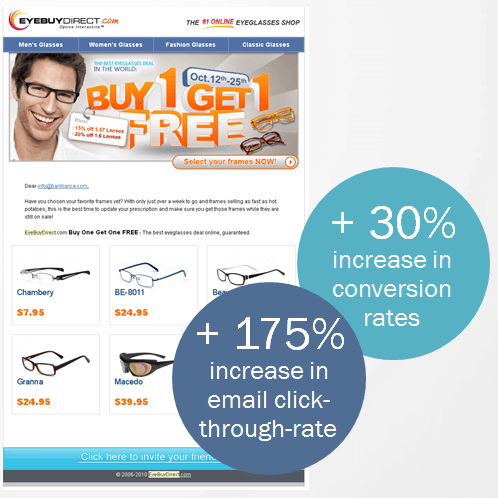 When it is done right, it could boost your open and clickthroughrates as well as conversions. However, it has it downsides. Personalization requires a lot of data mining. So, when the process is organized improperly, it can cause a lot of complaints from your subscribers. For instance, Getresponse found out that their personalized emails had 26% higher complaints and over 71% higher unsubscribe rates than emails without personalization.